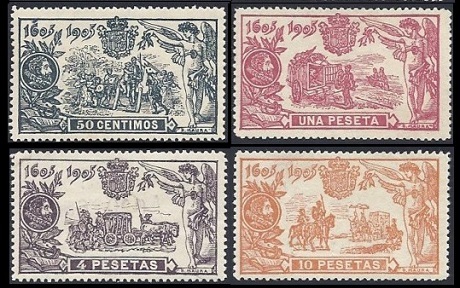 The first commemorative Spanish stamps appeared in 1905. 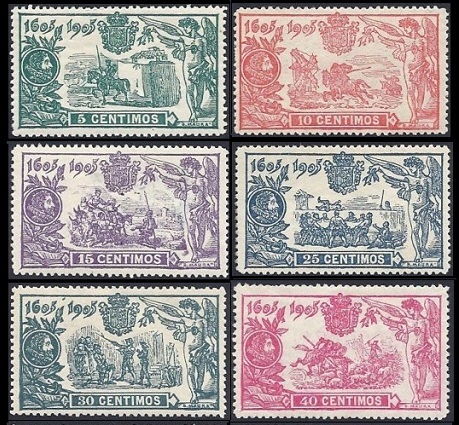 The commemorative stamps of this period celebrated the 17th Century writer, Miguel de Cervantes, and publicized international exhibitions and conferences that were being held in Spain. 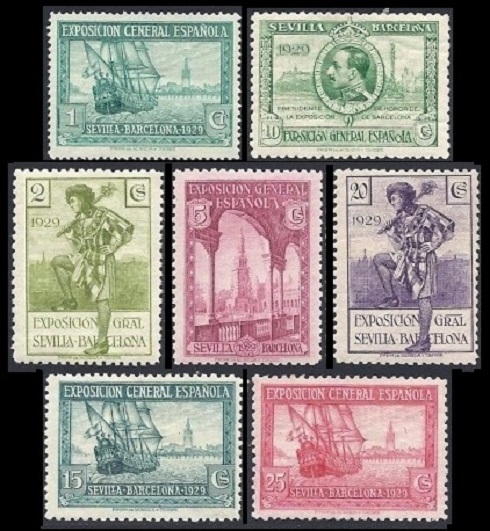 The ten pictorial commemorative Spanish stamps shown above (Sc. #287-296) were issued on May 1, 1905 to celebrate the 300th Anniversary of the publication of Don Quixote de La Mancha by Miguel de Cervantes. The central designs, featuring illustrations from Don Quixote, are as follows. 05 C. - Don Quixote sets forth. 10 C. - Don Quixote attacking windmills. 15 C. - Don Quixote meeting villagers. 25 C. - Sancho Panza being tossed in a blanket. 30 C. - Don Quixote being knighted. 40 C. - Don Quixote attacking a flock of sheep. 50 C. - Don Quixote on a wooden horse. 01 P. - Don Quixote and lions. 04 P. - Don Quixote in a bullock cart. 10 P. - Don Quixote and the enchanted lady. 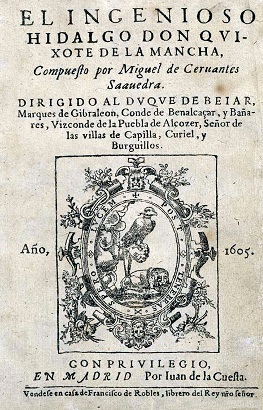 El Ingenioso Hidalgo Don Quixote de La Mancha or Don Quixote de La Mancha, published in two volumes in 1605 and 1615, is a satirical novel about the Age of Chivalry. The story follows the adventures of Alonso Quixano, a lower echelon member of the Spanish aristocracy, who has read so many romances about chivalry that he loses his sanity. He sets out on a series of rather bizarre quests to revive chivalry, undo wrongs, and bring justice to the World, under the name of Don Quixote de la Mancha. Don Quixote de La Mancha has long been regarded as one of the greatest novels ever written. 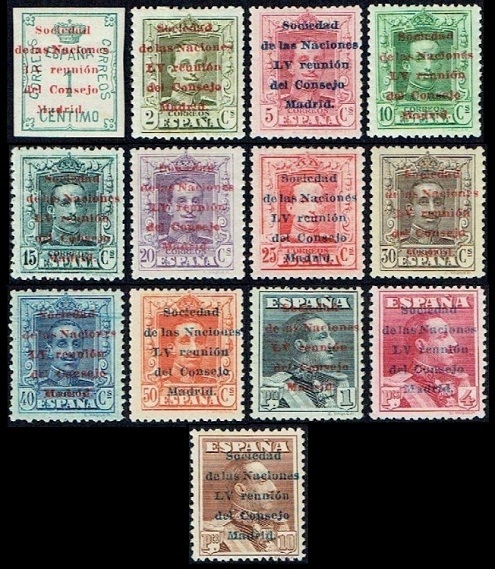 The thirteen pictorial commemorative Spanish stamps shown above (Sc. #318-330) were issued on October 1, 1920 to publicize the 7th Congress of the U.P.U. (Universal Postal Union) in Madrid. The common design features a portrait of King Alfonso XIII and the Palace of Communications in Madrid. 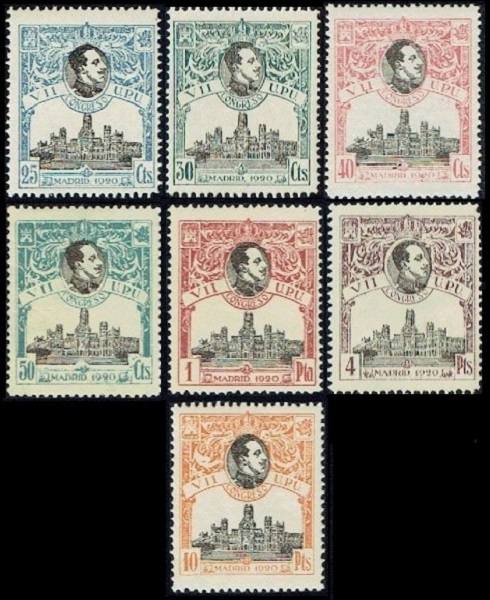 The thirteen pictorial stamps shown above (Sc. 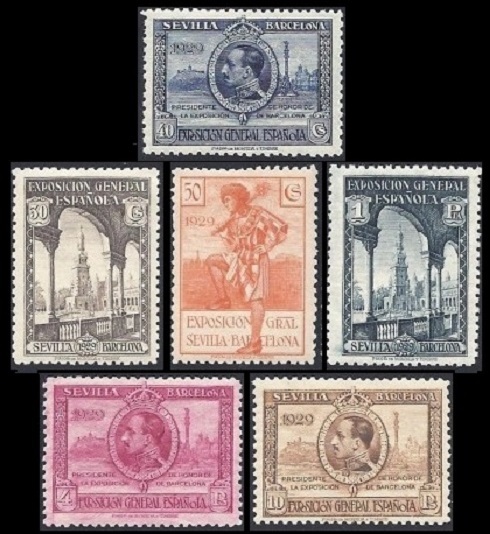 #345-357) were issued on February 15, 1929 to publicize the Seville and Barcelona Exhibitions. These stamps are perforated 11 (shown above) or perforated 14. The four common designs are as follows. The "Santa Maria" and a view of Seville. King Alfonso XIII and a view of Barcelona. 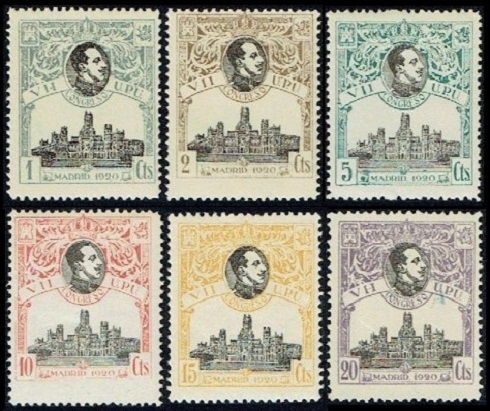 The thirteen overprinted definitive stamps of 1920-1922 shown above (Sc. #358-370) were issued on June 10, 1929 to publicize the 55th Assembly of the League of Nations, held in Madrid from June 10 to June 16. These stamps were only valid for postage during the assembly. 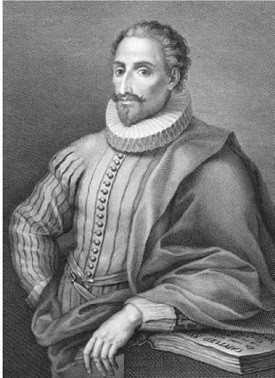 Miguel de Cervantes Saavedra (1547-1616), a Spanish novelist, poet, and playwright, is considered the greatest of Spanish language writers and one of the World's preeminent novelists. As is the case with many novelists, he could not support his family through his writing, so he worked as a soldier, an accountant, and as a tax collector at various times in his life. By an odd coincidence, he was a purchasing agent for the Spanish Armada in 1588. His major work, Don Quixote de La Mancha, is considered the first modern novel, and it is regarded as one of the best works of fiction ever written. Cervantes died of complications from Diabetes on April 22, 1616, one day before the death of his English contemporary, William Shakespeare (1564-1616). Cervantes was buried at the Convent of the Barefoot Trinitarians in Central Madrid.